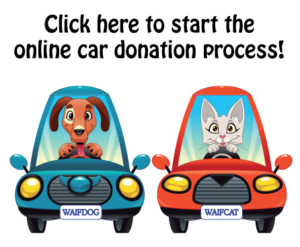 Donating your used car, extra car, truck, or RV into a tax deductible donation is a great way to support the shelter animals of WAIF! Simply click here to start the easy online process. You can also call 1-877-999-8322 and our car donation program partner (V-DAC) will take your information over the phone. It’s that easy!